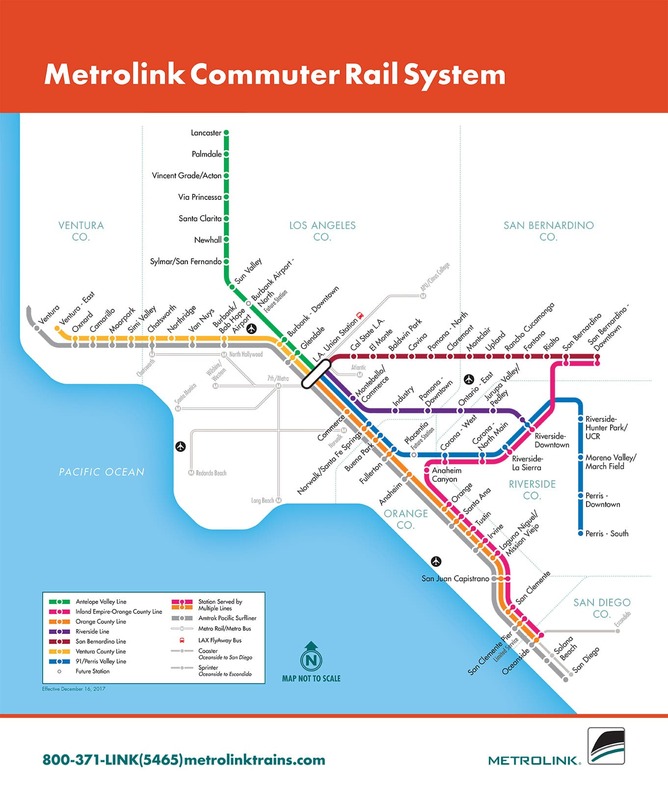 RCTC supports the Metrolink passenger rail system for a convenient travel option. Metrolink is one of Southern California’s best ways to beat the commuter blues. Metrolink trains have comfortable seating, on board restroom facilities, bicycle racks, and are ADA accessible. 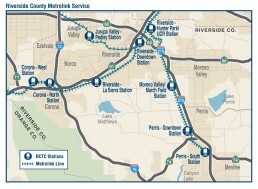 RCTC is a member of a five-county Southern California Regional Rail Authority that operates Metrolink. 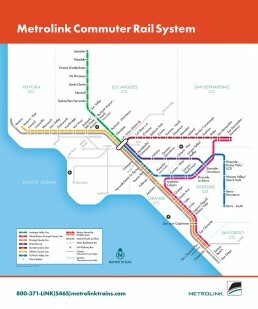 To learn more about Metrolink, click here. The Riverside Line travels to stations in Los Angeles County, including Pomona, Industry, Montebello/Commerce, and LA Union Station. It also travels to Ontario in San Bernardino County. The Inland Empire-Orange County Line serves stations in Orange County, including Anaheim Canyon, Orange, Santa Ana, Tustin, Irvine, Laguna Nigel/Mission Viejo, San Juan Capistrano, San Clemente, and Oceanside. The 91 Line/Perris Valley Line roughly parallels Interstate 215 and State Route 91 to destinations in north Orange County and south Los Angeles County, including Anaheim Canyon, Orange, Anaheim, Fullerton, Buena Park, Norwalk/Santa Fe Springs, Commerce, and LA Union Station. For questions about RCTC’s rail facilities, call 951.787.7141 or email info@rctc.org. 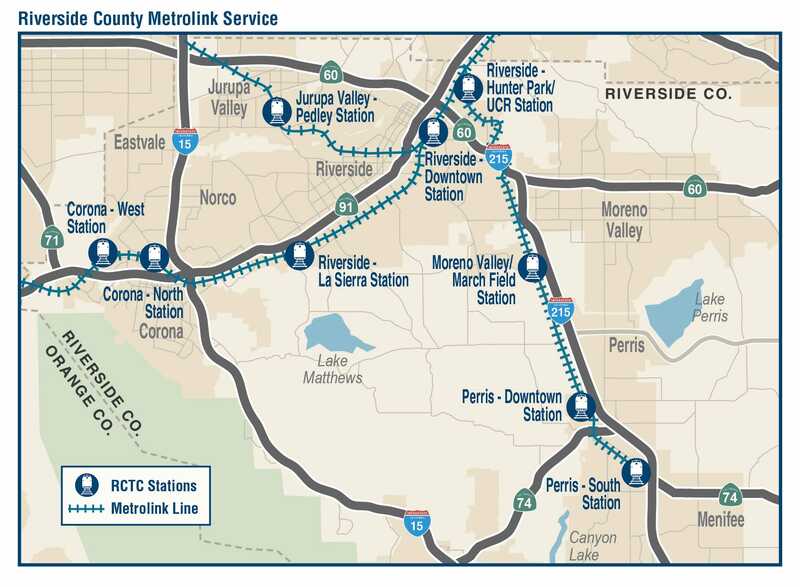 Unlike other Metrolink member agencies, RCTC owns and operates all of the nine Metrolink stations that serve Riverside County. All stations are ADA-compliant and are staffed with 24-hour security guards. Amenities include parking, vending machines, connecting bus service, and bicycle facilities (lockers, shells, racks). Look at the stations below for details. Individuals interested in conducting leafleting, solicitation, and/or political campaign activities at any of RCTC’s commuter rail stations must complete and submit a “Leafleting, Solicitation and/or Political Campaign Activities Permit Application” to the Commission’s Rail Department. All procedures and policies regarding the application process and advertising activities are outlined in the Non-Commercial Advertising Policy document, click here to download. Applications for a particular permit period shall be due by the 19th day of the calendar month immediately preceding the particular permit period. For questions, please contact RCTC’s Rail Department at 951.787.7141. When completed, the Leafleting, Solicitation and/or Political Campaign Activities Permit Application together with a copy of the material to be distributed should be e-mailed to speterson@rctc.org. Riverside County residents who carpool to Metrolink stations and then take the train are eligible for preferred parking at any of the Riverside County Metrolink Stations. Rideshare 2 Rails participants are issued individually numbered parking permits that must be displayed to allow them to park in specially designated areas. The Riverside County Transportation Commission (RCTC), in coordination with the Federal Railroad Administration (FRA) and California Department of Transportation (Caltrans), is studying options for providing additional Amtrak intercity rail service between Los Angeles and the desert cities in the Coachella Valley. The Coachella Valley – San Gorgonio Pass Rail Corridor Service would extend from Indio in the east to Los Angeles Union Station in the west, a distance of approximately 141 miles.